The Congress victory in that year made him discard the NDA only to rejoin it in 2014 and became a devotee of Narendra Modi. If Chandrababu Naidu, Chief Minister of Andhra Pradesh and president of the Telugu Desam Party, is the fulcrum of the Opposition mahagathbandhan to take on the BJP government of Narendra Modi in the 2019 Lok Sabha election, party president Amit Shah need not burn midnight oil devising strategies to thwart Opposition unity. The TDP was started in March 1982 by NT Rama Rao as a movement to drive out the deeply entrenched Congress, in which his son-in-law Chandrababu was a junior minister, from power and restore Telugu self-respect trampled by Rajiv Ghandi who was then a general secretary of the Congress. Within nine months the TDP was voted to power and Rama Rao became the Chief Minister. The quick-change-artist that Chandrababu is, he defected to the TDP after campaigning against it in the 1983 Assembly election. Under Rama Rao’s leadership, the TDP became the main Opposition party in the 1984 Lok Sabha election in which the BJP managed to win just two seats. The TDP won 30 out of the 42 seats in Andhra Pradesh and became the first regional party to gain that status. In 1995 Chandrababu staged a bloodless coup against his father-in-law who was recovering from a major heart ailment, took over as Chief Minister and leader of the TDP. Aligning with the Left parties, he was able to retain power in the 1996 Assembly election. In 1999, he saw merit in the BJP and joined the National Democratic Alliance and continued with it till 2004. The Congress victory in that year made him discard the NDA only to rejoin it in 2014 and became a devotee of Narendra Modi. A seasoned weathercock, he dumped the NDA in March this year. There is nothing wrong when a seasoned political leader like Chandrababu wanting to change sides to safeguard the interests of the party he is leading when he sees no future in the alliance he is in. But when he says, “We have to save democracy, institutions and the future of the country,” it should be taken with a pinch of salt. Making two visits to Delhi in a week, Chandrababu has met Congress leader Rahul Gandhi, leader of the NCP Sharad Pawar, president of the National Conference Farooq Abdullah, Samajwady party leaders Mulayam Singh Yadav and Akhilesh Yadav, BSP leader Mayawati, Delhi Chief Minister and leader of AAP Arvind Kejriwal and West Bengal Chief Minister and leader of Trinamul Congress Mamata Banerjee to bring them together on a common minimum programme to defeat the BJP. 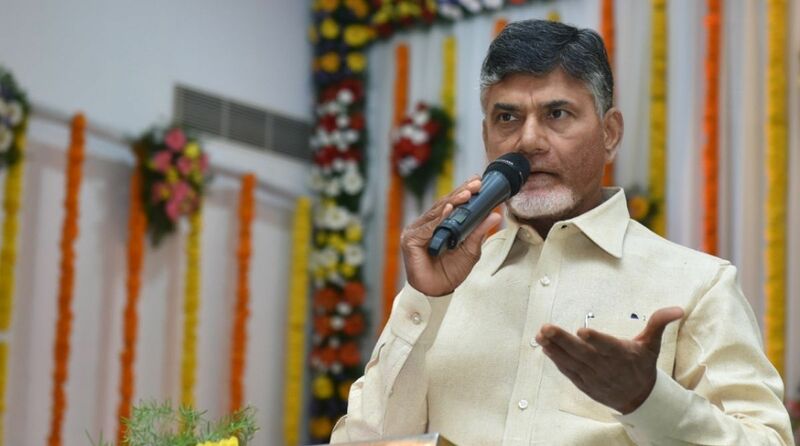 Time will decide who will lead this mahagathbandhan, said Chandrababu. There are at least three prime ministerial aspirants amongst these leaders. The day of reckoning for Chandrababu is fast approaching in Andhra Pradesh as his dream capital city of Amaravati shows least signs of taking off as envisaged by him. Farmers who parted with fertile agricultural land for the concrete jungle are rueing their decision. As Chandrababu is hobnobbing with the Congress, NTR, founder of the TDP, must be turning in his grave.